Canon Digital Learning Center put out a short article on how to use the Focus Preset function on their Super Telephoto lens. I never found a need for and therefore do not use this feature. "Most Canon super telephoto lenses have a cool feature called Focus Preset, which allows for quick focusing to a predetermined distance. It is an ideal tool when shooting sports or wildlife, where you might be rapidly changing focus from two vastly different distances. At a basketball game, for example, you can preset the focus on a basketball rim. Then, follow-focus the action using AI Servo AF mode via either the shutter button or the back button. When the action shifts to under or around the rim you’ve preset focus on, a slight twist of the serrated Focus Preset Ring brings that preset distance immediately into focus. The ring, located just in front of the manual focus ring, falls readily to my hand, whether I am hand-holding the lens or shooting from a monopod. The Focus Preset Ring, is a thin, serrated metal ring, located just in front of the manual focus ring. When turned slightly in either direction, the lens’s Ultrasonic focus motor instantly moves the lens to a memorized focus distance. The ring is spring-loaded, and returns by itself to its original position as soon as the photographer lets go of it. The process for programming the focus distance into the camera/lens memory is simple. 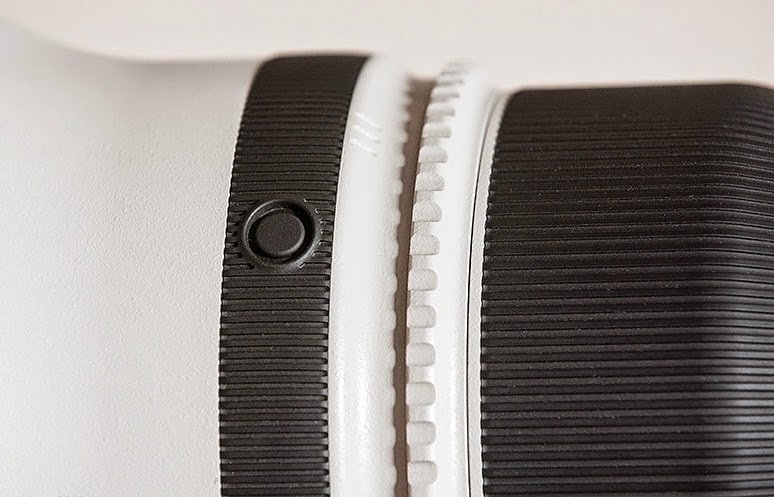 Three controls on a side panel of the lens are used. They are the Preset switch, the Set button and the Focus Preset ring. The Preset switch has three settings: Off ( O ), On ( I ), and On with sound (sound icon). 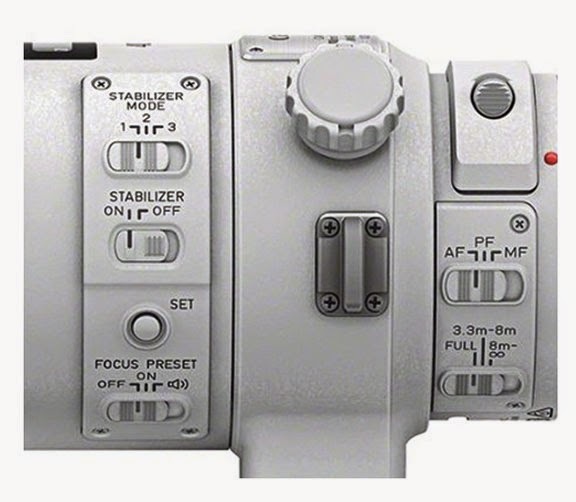 Focus Preset controls are on the switch panel of select Canon super-telephoto lenses. The Set button and sliding Off–On–On with sound switch are visible in the first image.